Why is Google really rolling out Google Analytics opt-out plug-in? Last week I wrote about a browser plug-in that will allow people to opt-out of the Google Analytics cookie. The release of this plug-in seems to be a proactive step towards another announcement. Eric Peterson, on his blog, voiced his opinion on why Google is rolling out this plug-in. I think Eric has a point in his post about Google trying to make a push into Federal Government web sites and this roll out is a check-box to satisfy the needs of privacy advocates. However, I am still not entirely clear on what Google will get if it can’t use all the data that it will collect on Federal Government website? It won’t be able to use in any way…well maybe at an aggregate level to compete with the likes of ComScore. So what do I think the reason is? I think the real answer to Google Analytics’ rolling out Opt-out is “Behavioral Targeting”. Google Analytics is deployed on thousands of websites and collects a wealth of data. However, so far this data is used by individual sites to optimize their ad spend and improve the site for customers while improving the websites impact on the bottom line. Google has not really used that data much other than providing benchmarking reports in Google Analytics. I think the time has come for Google to start using Google Analytics data to make more money. Remember, in 2006 Google Analytics started asking GA accounts to opt-in/opt-out of data sharing. As I wrote in my blog post on Google Analytics Data Sharing, “data sharing” was a step towards using Google Analytics data for behavioral targeting. This opt-out plug-in seems to be a next step in that direction. Last week Google Adwords announced the roll-out of “Remarketing” feature that will allow advertisers to remarket to the visitors (cookies) who came to their sites but left without taking the desired action i.e. without converting (this is also called Retargeting, a form of Behavioral Targeting). For this feature to work, Adwords advertisers will have to put a small script and identify the people (cookies) whom they want to target. The functionality to identify the segment that you want to retarget seems to be very limited in Adwords. I want to target visitors who viewed more than 3 products and looked at the contact us page and then left without converting (or it could be more complex than this). This is a segment that I won’t be able to create easily in Adwords without some coding on my pages. Using Google Analytics, advanced segment functionality this is a piece of cake. I create my segment then use Adwords to remarket to visitors who fall in that segment. Won’t that be more powerful? I think that’s where the money is. Let’s take a hypothetical example to see how this will work. Say I write a blog on luxury cars. I use Google Analytics as my web analytics tool (it is free, so why not). I don’t have real business model but I use Adsense ads to make some extra money. Since my blog is really popular I get lot of traffic. My blog reader are those who have interest in luxury cars because that’s all I write about. How will Google use that data? Google will identify the visitors who come to my blog, read articles, write comments, come often etc. They will then put the visitors (cookies) who fulfill certain criteria (as defined by Google or the Advertiser) in a segment called “Luxury Car Enthusiast”. They will pool my data with other similar sites or similar pages on other sites to create a bigger pool than my site has to offer. Google now has a set of cookies who are interested in luxury cars. BMW creates a campaign in Adwords to reach “Luxury Car Enthusiasts”. They are willing to play 2X-3X CPC or CPM to reach this target. A visitor, who left my site (A) and lands on a site (B) that, has nothing to do with luxury cars. Google can identify that visitor because that visitor is in the pool of cookies that belong to “Luxury Car Enthusiasts” segment. Google shows this visitor an ad from BMW on Site B. Visitor sees the ad that matches his/her interest and the advertiser reaches their target. Note: This all is a speculation by me and I have no official information. Google gets more money for the same ad slot. Publisher of the ad makes more money. Sites, which pool their visitors in this segment, get a cut. What does GA Plug-in has to do with all this? Behavioral Targeting has been under scrutiny for a long time and there is a big uproar about tracking people. Privacy advocates want an easy way for people to opt-out of Behavioral targeting and this plug-in seems to be a proactive step in that direction. You visit a site, look at some products, maybe add some of the products to the shopping cart but then decide not to buy them because you need some more time to think about it. You close your browser and are done with that site. Few minutes later you go back to your computer and browse to another site, say a news site. As the page of that site loads so does an Ad that is from the site that you visited yesterday (where you looked at some products but did not buy). For Google Remarketing to work, the news site will need to be a part of Google content network. So far Google used to show Adsense ads based on the content of the page but now it will start showing ads that match the interest of the person viewing the page (as identified by a cookie and retargeted by a marketer). Neel visited Netflix. He looked at the site but decided that he is not going to become a member at that time. He went back to his work and completely forgot about Netflix, maybe because he got a movie from Redbox. 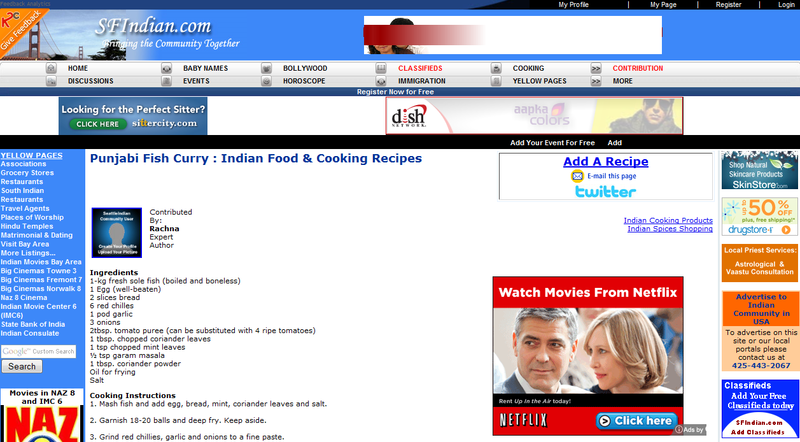 Few minutes later he gets back on his computer and browses to a site to read about Indian Food Recipe. This site happens to be a part of Google content network. 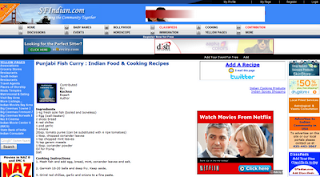 Even though the content that Neel is reading has nothing to do with the movies, Google’s remarketing shows him a Netflix ad. Note: This is a hypothetical example and I am not sure if Netflix is really participating in the Google Adwords Remarketing. Netflix, which participates (let's assume) in Google Adwords decides to remarket to people who had visited Netflix in past but did not sign up for the service. Netflix decides to use Google Adwords new "Remarketing" feature for this remarketing. In 2007, I speculated that Google will roll out something along these lines. I highly encourage you to read the following blog post as I think there is more to come from Google on Remarketing and Behavioral Targeting. During 2007-2008 I wrote a lot about online privacy on this blog. Most of the online privacy discussion at that time revolved around online targeting based on tracking users online behaviors also knows as behavioral targeting. It amazes my how many privacy advocates and senators are concerned about anonymous online tracking and behaviorally targeted ads based on peoples click behavior when the consumers are voluntarily giving all the private information on social media sites. Last week Google Analytics announced a plug-in that will let users opt-out of Google Analytics. Really...is web analytics tracking detrimental to visitors' privacy? Google Analytics collects click stream data anonymously. It does not know who you are, it identifies you via a cookie and tracks what pages were viewed by that cookie, what buttons were clicked by cookie etc. This data is then used by individual sites using the tool (Google Analytics) to understand the behavior of their visitors and optimize the experience both for the user and their business. Where is the privacy threat in all this? Proliferation of the services like Facebook, Twitter and location based services like Gowalla and Foursquare have enabled people to share their personal information with their "friends". Users of these services are willingly giving a lot of personal information. Information, that can be used by others ("friends"), in so many harmful ways. But is general consumer aware of such harms? Why isn't that the most important issue? The real threat to privacy is the lack of education about the online information sharing. We are the ones who are voluntarily revealing a ton of information, which is far more harmful than anonymous click stream behavior. Using Facebook, twitter and Foursquare you can pretty much know what a person likes, dislikes, who the family members are, what time they leave the house, what time they arrive at work, where do they spend their day, afternoon, evening, what they wear, etc. That to me should be more concerning than anonymous web analytics tracking and the ads that are targeted based on a users click behavior. Most of the consumers don't even know how all the little personal information they are leaving on social media sites could harm them. I have not seen any public service ads warning me about the downside of using such services. Shouldn't there be those ads warning people, both offline and online? In my opinion governmental agencies, privacy advocates and marketers should focus their attention on consumer education. Educate them about various tracking methods, implications of information sharing on social media sites etc. No matter how strict the online tracking & targeting rules are you won't be able to avoid privacy leaks unless the end consumer is educated about the implications. Late last week Google Analytics announced a browser plug-in that will allow users to opt-out of Google Analytics tracking. As an enterprise-class web analytics solution, Google Analytics not only provides site owners with information on their website traffic and marketing effectiveness, it also does so with high regard for protecting user data privacy. Over the past year, we have been exploring ways to offer users more choice on how their data is collected by Google Analytics. We concluded that the best approach would be to develop a global browser based plug-in to allow users to opt out of being tracked by Google Analytics. Our engineers are now hard at work finalizing and testing this opt-out functionality. We look forward to make it globally available to our users in the coming weeks. This is the biggest question everybody is asking. Since I don't have the full information on how this plug-in will exactly work, let's take a look two potential ways this plug-in can work. Let's assume that this plug-in will ensure that absolutely no data about the users behavior on any of the site that user visits will be collected. Which means that Google Analytics will completly ignore the presence of that person (computer) as if that person never visited the site. In that case all of the data, i.e. visitors, visits and page views, conversion etc., will be under reported. 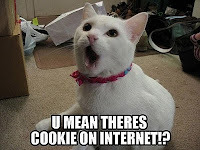 In this case, a session level cookie will still work but this cookie will be removed from the users computer after every session. This will result in the accurate count of visits (sessions) and page views and all the data that is reported at visit or page view level. 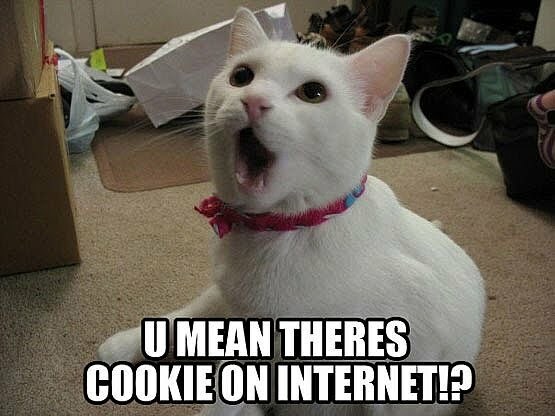 However, the visitors count will be inflated since same person (computer) will get a new cookie for every visits. How big the impact will be? Well, it is not clear how widespread the use of this plug-in will be. Currently, there are 3rd party tools available clear or block Google analytics cookies but the use of such tools do not seem to be an issue for Google Analytics tracking. So I wonder if this plug-in will have any huge impact on Google Analytics data. However keep in mind that there will be some impact. Last week I was on a “Measuring Success” panel at PR+MKTG camp in Seattle. Someone from the audience asked if there were any tools for a newbie to start measuring PR & Marketing efforts and learning. I uttered the names a few tools that came to my mind. Considering that there might be many others in the same situation I decided to write this blog post. In this post I am listing some of the tools that you can start using for free. Please note that this is not the most comprehensive list of the free tools. Side Note: All the panelists unanimously agreed that you need to first figure out your measurement needs based on your business requirements and KPIs and then find the tools that meet your needs. One of the biggest mistakes most companies make is that they pick the tools first and then try to modify their measurement needs according to the tools they have in place. However, I recognize that someone who is not familiar with the various measurement tools needs some exposure to the tools to really think about the questions they might want to ask before making an investment in a paid tools. Use the following search tools to learn what keywords your customer/potential customers are searching for so that you can optimize your site accordingly. Google Webmaster Central – Provides you data on how your sites in crawled and indexed by Google. Bing Webmaster Center - Provides you data on how your sites in crawled and indexed by Bing. Yelp.com – Good for small and medium size businesses. Find out what customers are saying about you and your competitors. Want to know how your competitors are doing compared to you? Use some of the tools listed below. Keep in mind that all of these tools use different ways to collect the data and hence the actual data you get from one tool will differ from the other but overall it should provide you good competitive information. Like, I mentioned above this is not the most comprehensive list but it should get you started. Do you have a favorite free tool that is not on this list? Leave a comment on this blog post or send me an email with the name of the tool.